Regardless of which country you come from or where you live, one of the most satisfying ways of achieving self-fulfillment and personal growth and at the same time forging very tight and often unbreakable bonds with your neighbours and fellow local residents is through community volunteer work. In my case, as a foreigner settling into Singapore, it has also been a means to achieving a very deep level of integration in my heartland community. Not only have my local relationships developed from ones of 'familiarity' into those of 'strong friendships', as a Caucasian married to a beautiful Chinese wife with two absolutely adorable Eurasian children, I feel that although we may be considered a 'minority' (racially) in our local estate, we feel completely accepted by those around us. There is never any animosity and I have learned that the colour of my skin or country of heritage is of absolutely no consequence in my day to day interactions. Sure, when we first moved to Singapore all those years ago, living in a condo in Woodlands, we were both scared and intimidated... we were not sure at all how we should go about integrating, earning and giving respect and gaining acceptance. For the first couple of years, we were certainly not doing a great job of it at all. In fact, we even took people staring as a sign of dislike toward us - when in reality, what we considered may be a 'coolness' from local Singaporeans at the time, was probably more due to inquisitiveness and curiosity. Let me tell you for a fact... open your heart and lives with no pretense and you will surely find (as we have) that Singapore is one of the most warm and kindest societies on this planet. As a part of my collaboration with notatourist.sg, I wanted to reach out to fellow foreigners looking for ways to integrate and become accepted as part of their local community, by offering some brief guidance and key links on how they can offer their services through Grassroots volunteer work. (Please note, the following information is far from exhaustive, and I strongly encourage you to have a surf around the People's Association website - link attached at the bottom of this article). 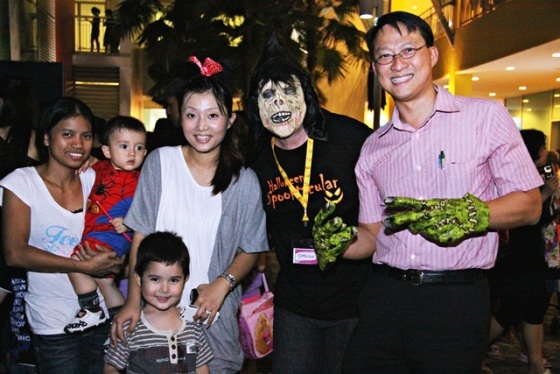 As my role as a Grassroots Leader in Sengkang West, the past year has seen a very exciting range of activities and the number of new personal and family friendships are too many to count.... from working with Residents' Committees on block parties, divisional activities and events (I even had the opportunity to meet Prime Minister Lee at our Sengkang West Wellness Day) to the huge Halloween party we held at the CC in late October, for which I was co-chairman of the organizing committee. It's been a huge year!! Specifically, although my main role is as a member of the Anchorvale CCMC (Community Club Management Committee), I often also work closely with my local Residents' Committee on things even 'closer to home'... in fact, I even patrol our estate with the local constabulary as part of the COP (citizens on patrol) - in collaboration with the police force, it is known as the 'Neighbourhood Watch Zone' program. For more information on what the CCMC does, click here. In summary, Community Club Management Committees (CCMCs) "help build, manage and maintain all our Community Clubs (CCs). CCs are the common meeting ground for residents from all walks of life by providing numerous recreational activities and learning opportunities. CCs also connect residents and the Government by providing relevant information and gathering feedback on national concerns and policies. Each CC serves about 15,000 households or an average of 50,000 people". 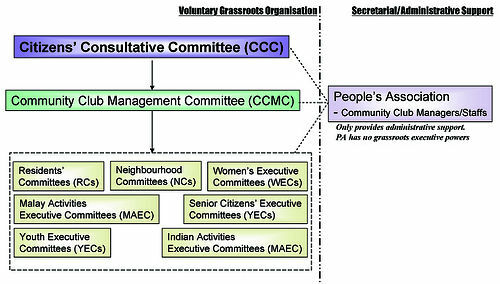 Within our CCMC, are five executive committees - Senior Citizens' EC, Women's EC, Youth EC, Malay Activity EC, Indian Activity EC. Through this network, we "promote racial harmony and social cohesion through the various cultural, educational, recreational, sporting, social and other community-based activities organised specially for residents." The full list of organizations and committees available for volunteering can be found on the PA website, under the Grassroots Organization section. To sign-up as a volunteer, simply go here and register your details and interests. One of the most common questions I get asked on signing up as a volunteer, is "But I don't live in a HDB estate, how can I get involved?"... Well fret not, dear friends - residents of private housing estates can still play their part by joining a Neighbourhood Committee. Still in doubt or need extra advice, please feel free to reach out to me directly via email or comment. Wow I've been reading this blog for abit and I must say I'm highly impressed. You've integrated so well into our way of life and what amazes me alot more is that u are really enjoying it. This is really the way to go mate. People like you are always welcome in our country and are no different from us. Your positive attitude towards National Service and defence is certainly heartening, myself having served in the forces a decade ago. Australians have always been the most committed to our defence in our entire history. I have to wonder though, how do u NOT miss all that good barbecue, nice beaches, nice weather, kebabs, 2 dollar pizzas, 2 dollar fish n chips, good booze, beers, footie and beers, massive open spaces. An entire town in the middle of nowhere in Australia usually has a fraction of the number of people found in an average Singapore HDB estate. Greek food! That's another one. I've had some of the best Greek in Australia but never found it here. U don't get homesick once in a while?